The new arrivals are already getting into the ‘swing’ of things and making friends, under the watchful eye of their doting parents, Chillido and Wicket. 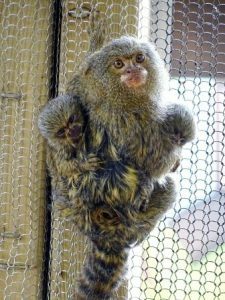 Pygmy Marmosets are listed as Least Concerned on the IUCN Red List, however, their wild population is decreasing due to being severely fragmented. They are also under threat because of habitat destruction and the pet trade, so it’s fantastic that Drayton Manor Zoo is able to breed and raise them in a safe environment. They originate from South American Rainforests and their diet consists of gum, plants, fruits insects and sap. These clever species use their sharp teeth to gnaw at trees for the sap to be released and like other monkeys, they love being high up in the trees and live in groups of around a dozen. On a visit to Drayton Manor Zoo, families can make memories and learn all about animal welfare and the exciting conservation projects that the zoo is actively involved in. For more information about Drayton Manor Zoo please visit www.draytonmanor.co.uk/zoo. To book tickets to Drayton Manor Park visit www.draytonmanor.co.uk or call 0844 472 1950. « Num Noms Series 4 have arrived!